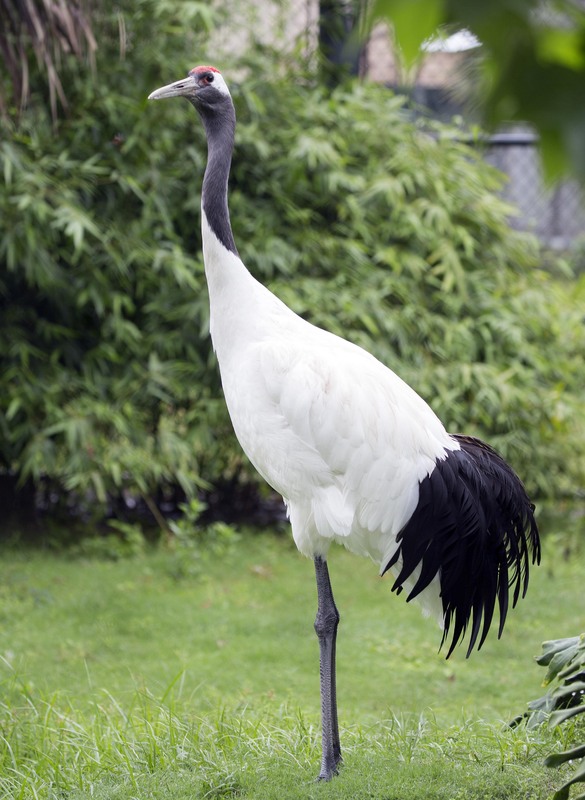 The Red-crowned Crane is also called the Japanese Crane or Manchurian Crane. 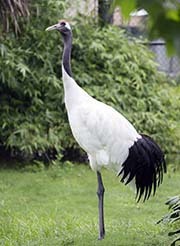 It is one of the largest cranes in the world and is the second rarest. It is native to East Asia. 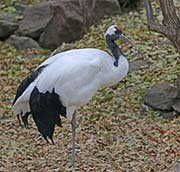 Other names for this species include Japanese Crane and Mongolian Crane. They are the symbol of fidelity, good luck and long life in the Orient. 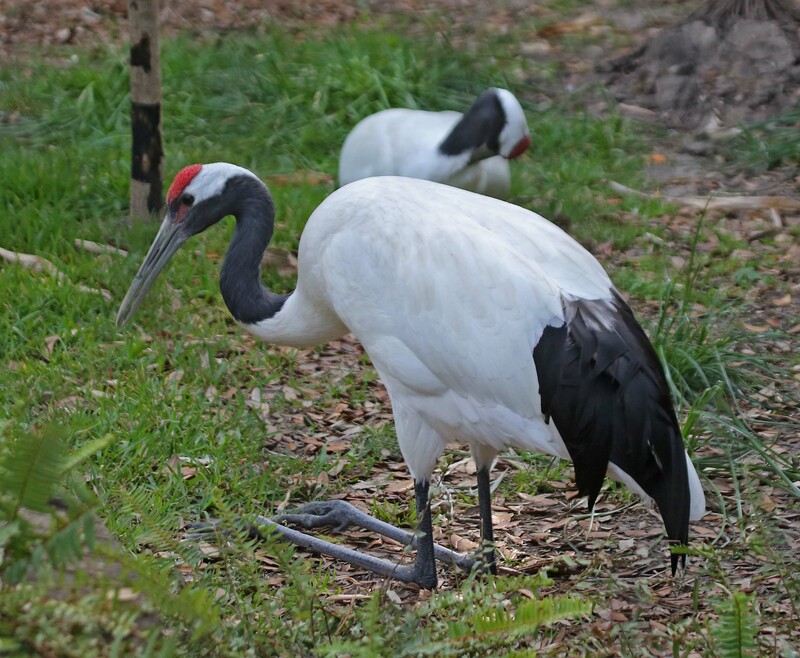 Red-crowned Cranes are mostly white with black secondary and tertiary feathers. 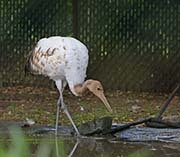 They are the only crane that has white primary feathers. Their head feathers are black on the cheeks, throat and neck and elsewhere white except for the forehead and crown which is red bare skin. Their long legs, feet and bill are greenish grey and their iris is dark brown. 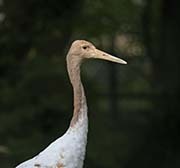 Juveniles are white, shades of brown and gray and the forehead is covered with gray and tawny feathers not bared red skin. 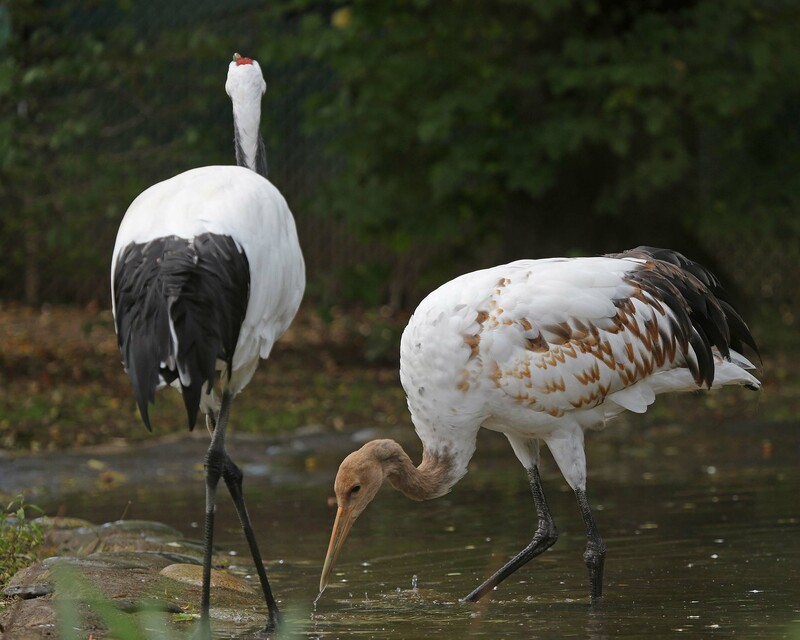 The Red-crowned Crane is seriously threatened by loss of habitat throughout its range. Human development, especially agricultural expansion, reed harvesting, river channelization, deforestation, and road building, is destroying many of the historic breeding wetlands. Additional threats include fires that destroy nests, harassment by people, and poisoning from pesticide-treated grain. 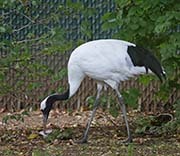 Diet: The Red-crowned Crane are omnivores. They eat cultivated crops, aquatic plants, acorns, variety of fish, frogs, salamanders, snails, crabs, dragonflies, ducklings, small birds and small animals. When they capture larger prey that they can't swallow whole, they will shake the prey and eat the pieces as they are shaken off. Most foraging occurs in wet grasslands, cultivated fields, in shallow rivers or on lakeshores. 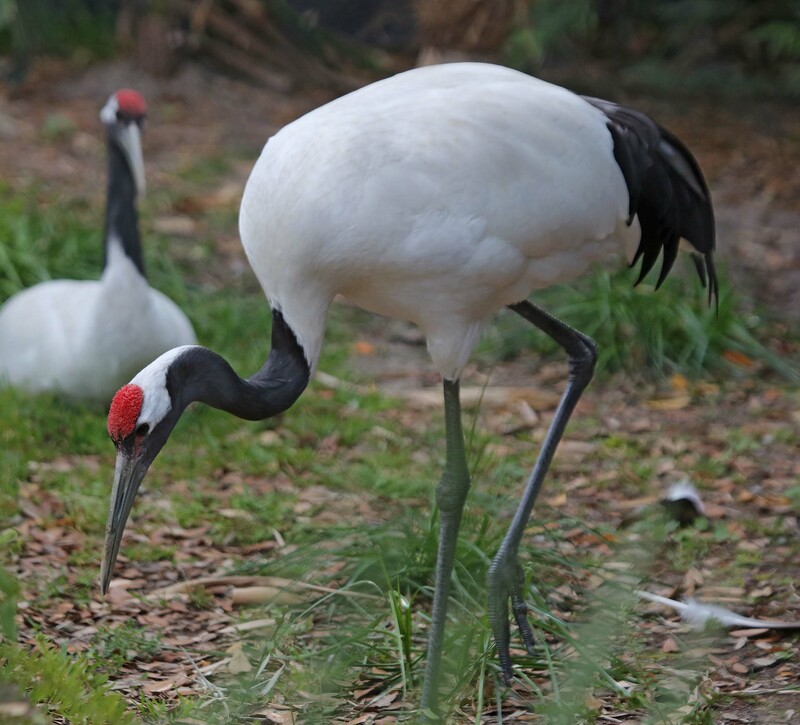 Courtship: Red-crowned Cranes are monogamous and mate for life. Red-crowned Cranes have an elaborate courtship dance in which they will leap while calling, do head-bob to each other, and bow with spread wings. Grasses, sticks or feathers are tossed in the air. Besides being part of the courtship ritual they are done throughout the year which probably strengthens the pair bond. Younger birds also 'dance' and the reasons for this may be to help with motor development and to relieve aggression and tension. Nesting: Both sexes construct the nest on the ground in a marshy area. It is made of reed and grasses. The female lays 2 light brown spotted eggs. The chicks are precocial and are born asynchronously and usually only the eldest chick survives. Both parents feed the chicks a protein-rich fish diet. Habitat and Range: Red-crowned Cranes are found in Japan, China, and the Korean Peninsula. They are a highly aquatic species and feed in deeper water than other cranes. They breed in large wetlands in temperate East Asia and winter along rivers and in coastal and freshwater marshes. Vocalization: Cranes have specialized vocal adaptations highlighted by an extremely long trachea that coils within a hollow sternum. They produce a wide variety of calls ranging from low pitched purrs to the loud unison calls involved in courtship and pair maintenance. The calls of male and female cranes differ in pitch. Plumage/Molt Like most cranes, molts annually during the post-breeding season. The main flight feathers are lost at the same time leaving the crane flightless. Migration: The Red-crowned Cranes in Japan are not migratory. 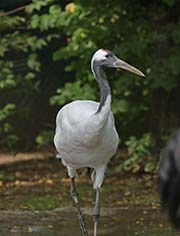 The Cranes on the mainland breed in north-eastern China, Russia and Mongolia (spring and summer) and migrate to eastern China, North and South Korea (fall and winter).